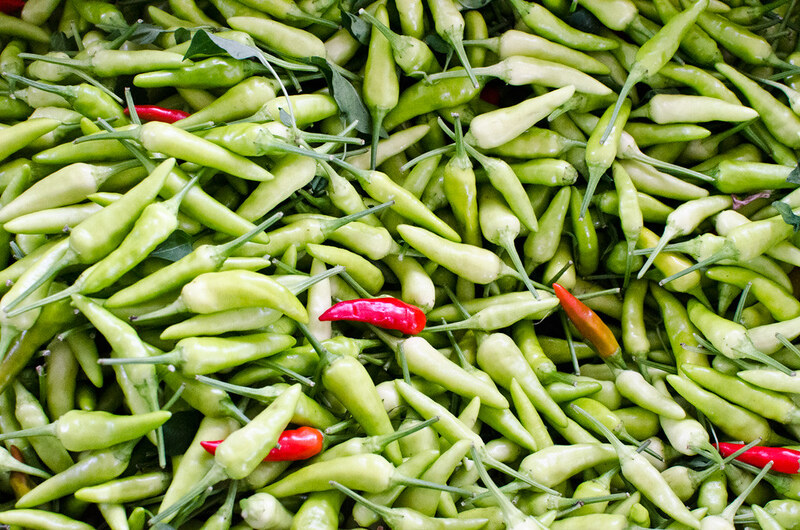 The Farmer’s Markets are overflowing with different kinds of hot peppers this week, from these tiny Thai bird chilis to the long, hot and sweet Hungarian peppers. If you look around, you might even find some of the world’s hottest peppers. Forget habaneros, I’ve also seen the naga bhut jolokia — possibly the hottest chili in the world — at a few of the city’s Greenmarkets. Next week I’ll be posting about how to cook with these peppers without killing yourself, so if you see some for sale and you’re curious go ahead and pick them up. I’ve seen all kinds of eggplants. Purple ones can range in color from a pale pastel to a deep dark almost black hue. Green ones and white ones, and ones that are mottled so that they look like painted Easter eggs. I’ve seen eggplants as large as a melon, long skinny ones that look like snakes, and tiny ones no bigger than a tear drop. 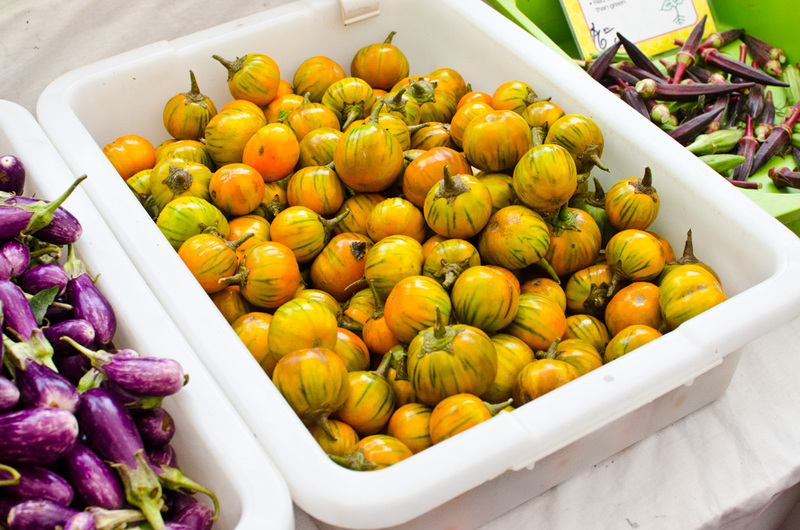 I’ve seen things you people wouldn’t believe… But until my visit to the Union Square Greenmarket yesterday, I’d never seen orange eggplant. These are Turkish orange eggplants, and I had to grab a handful of them just for the novelty of it. The sign said they retain their orange color after cooking; I will let you know how they turn out. 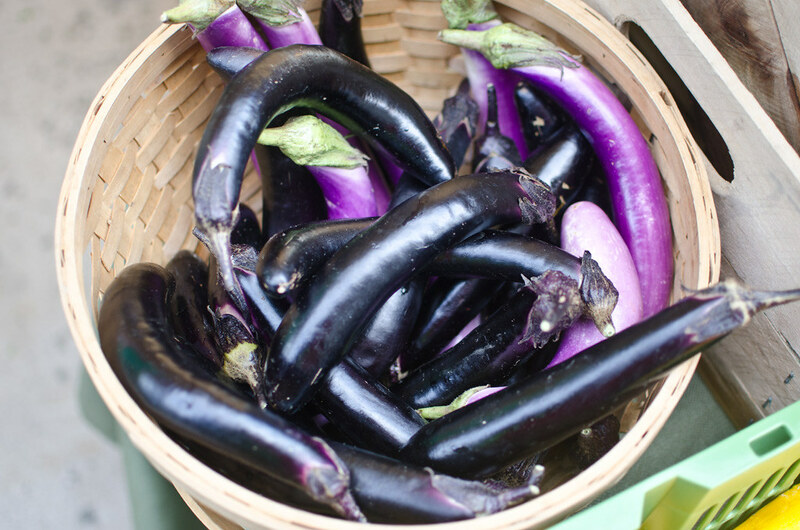 Japanese eggplants are longer and thinner than the round, plump variety we refer to as Italian eggplants. Whether or not the names belie some cultural bias I don’t know. What I do know is that the slender Japanese eggplant is extremely easy to cook with. I don’t even peel them; I just cut them into thin rounds and fry them in olive oil until dark brown on both sides — it only takes about 10 minutes. Then I season them with salt, pepper, and chili flakes, then squeeze on a little lemon juice. The eggplant becomes velvety soft, and practically melts in your mouth. The only thing I wouldn’t use them for something like eggplant parm, which requires a more substantial piece of eggplant. 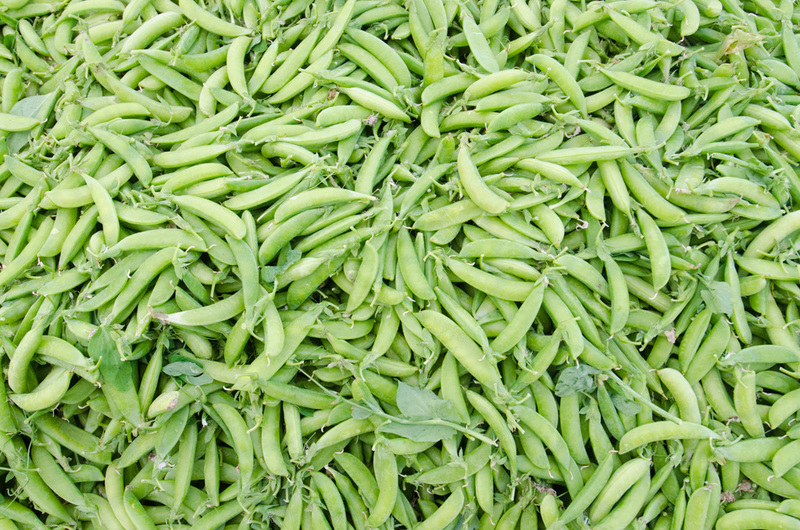 Sugar snap peas are here! Judging from our twitter feed, many people are unsure whether or not you can eat the pods. The answer is yes — but there is a small bit of prep you have to do first. Pinch the top stem between your thumb and finger and pull forward sharply. This will pull off the stem as well as the tough, fibrous bit that sits in the seam of the pea pod (see below). After that, you can pop the whole thing in your mouth. What a difference a few days makes. Two days ago it was 80 degrees; this morning it was 42 and rainy. 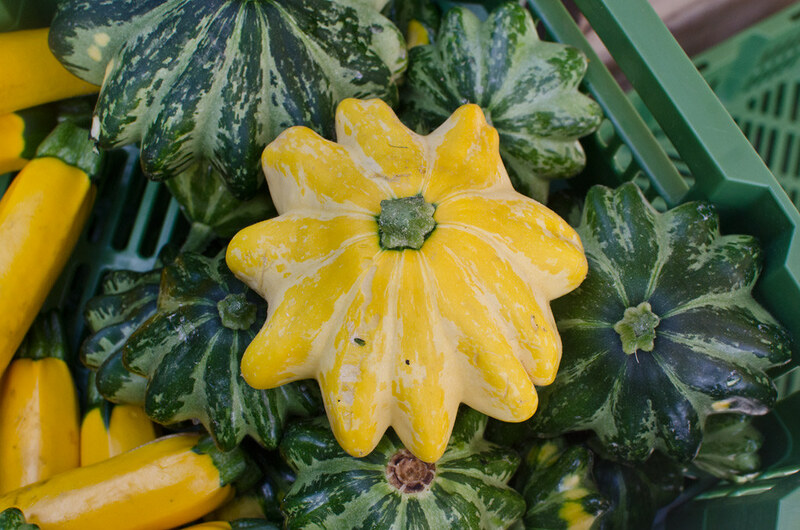 The Greenmarket still has a lot of interesting spring produce, though. 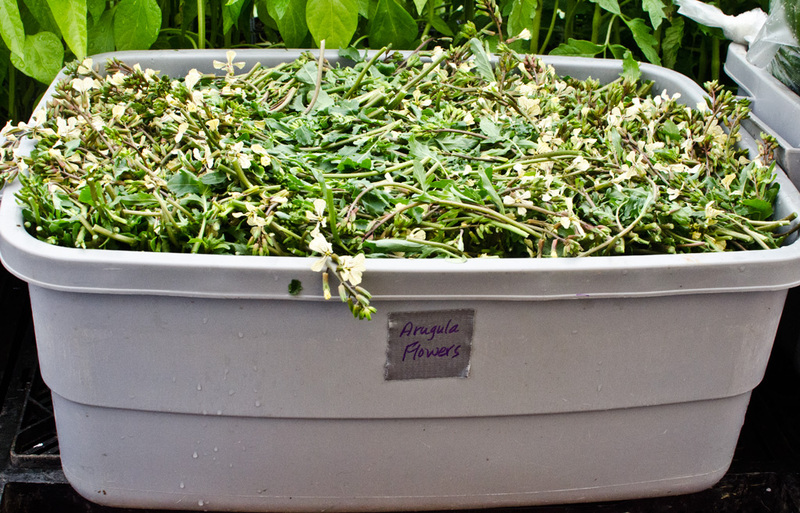 I’ve seen kale flowers before, but never arugula flowers. I’m a big fan of using different parts of plants than we normally see, so I had to pick some up for myself from Evolutionary Organics. They suggested using them in a salad, though they also mentioned that Franny’s uses them on one of their pizzas. 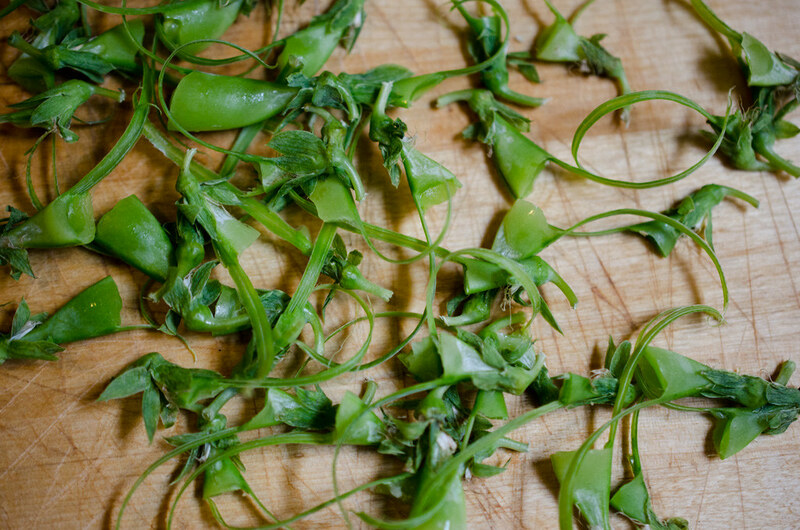 I plan to blanch them quickly in salted water, then toss them with lemon juice and olive oil — that’s one of my benchmarks for when I’m trying a new kind of greens. 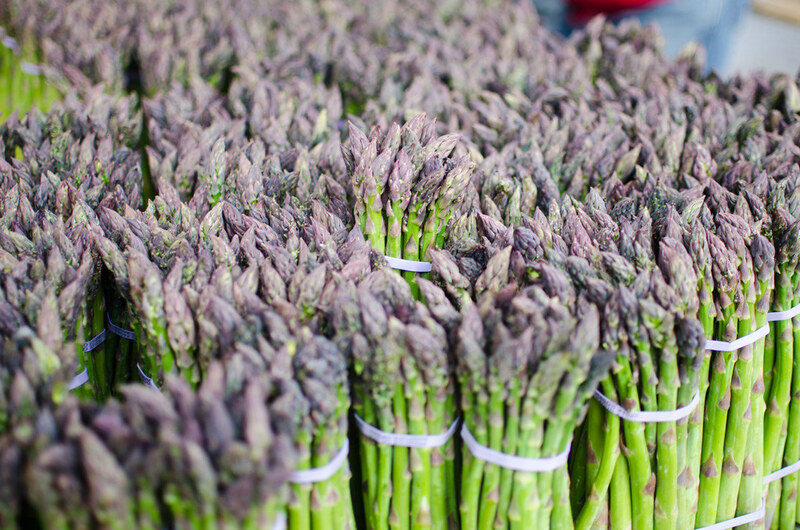 Because of the asparagus allergy I developed a few years ago, all I can do is stare wistfully at asparagus when it appears every spring at the farmer’s market. This time of year is especially hard — you can find all different sizes of asparagus; pencil thin or thick and crunchy. This would be a good time of year for Donny’s proposed 11-course asparagus dinner.